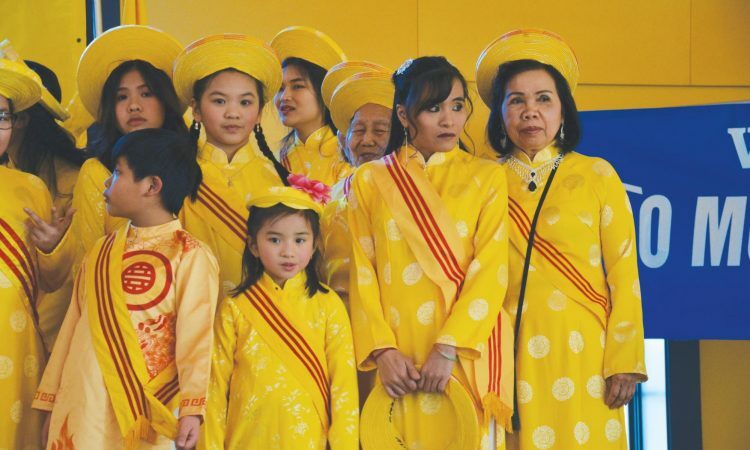 Although the Vietnamese Tết New Year was in February, the University of Puget Sound hosted a celebration put on by the Vietnamese American Community Association and the Vietnamese Senior Association of Olympia & Vicinity on March 9. The event had been postponed due to the snowstorm in February. Around noon in Upper Marshall Hall in the Wheelock Student Center, students, staff and faculty joined with members of the wider Tacoma community to welcome in the year of the pig. According to the event program, Tết celebrates the lunar new year, marking the beginning of spring. The event was given in both Vietnamese and English. However, as some customs would be difficult to explain, the program guided audience members in understanding the context and relationships behind certain events. The event started with the singing of both the Vietnamese and American national anthems, led by the Lincoln High School Junior Reserve Officers’ Training Corps (JROTC). As the Vietnamese organizations who sponsored the event are comprised of both veterans and seniors who came to Washington from the Vietnam War, it was important to the members that they honor both identities. A moment of silence was also held to mark the 51st anniversary of the Tết Offensive, the name of a series of attacks by the North Vietnamese and communist Viet Cong against South Vietnam, which turned the tide of the Vietnam War. The bittersweet introduction was quickly followed by the much-anticipated Lion Dance. The most excited audience members included small children who boldly ran up to these big noisy lions and “fed” them money offerings. Interestingly, some of the lion dancers were not asked to perform until the morning of the event. “We just looked around and said we needed two more lions,” community member and organizer Yo Du Ly said. Unfortunately the lion dancers that had performed in previous events graduated from the University of Puget Sound last year so Ly emphasized that they are still looking for lion dancers for future events. After the Lion Dance, the event paused for lunch, donated by Nu Thuy Restaurant and Hong Kong Supermarket, with extra refreshments donated by the The University of Puget Sound’s Luce Initiative on Asian Studies and the Environment (LIASE). Other sponsors for the event included the City of Tacoma Arts Commission, Hong Lan Fashion shop and Big John’s Trophies. The second part of the event included performances by the Sunflower Dance Team, the Kaimiola Dance Team, and singers. According to the program, the Sunflowers started in 1995 as a way for refugee children to keep their culture alive. In the beginning, linguistic and cultural differences were hard for the girls and so the group provided support. The Sunflower dancers, a combination of middle to high school students, were excited to dance, rushing back and forth from the dressing room to the stage in their bright yellow áo dàis. “We’ve been practicing for two months … We were like, ‘You know, more practice!’ so it was fine,” Sunflower dancer Vy Bui said about the delay due to the snow. Nancy Sweezey, the founder of the Kaimiola Dance Team, connected to the Vietnamese community by teaching dance to the Golden Bamboo senior Vietnamese Women’s Group. Their performance showed the power of connecting communities through dance. The event finally concluded with some senior members of the Vietnamese community singing traditional and popular Vietnamese songs. “I’m an alum of UPS so I know their venues … and I thought it would be nice for UPS to connect … I know UPS and I know they care about connecting to local Tacoma and getting out of the UPS bubble so it seemed like a perfect opportunity … by bringing community members in,” alumni and community organizer Renee Meschi said. From the appearance of the packed room it appeared the event was successful in bringing together different people and cultures to welcome the new year.